Experience Tiny Living Inspiration Firsthand! The Tiny House Bundle Sale is back for 5 days ONLY! Are you ready to embrace a new simple lifestyle? Are you planning to build a tiny home? Then this one stop bundle sale is for you. 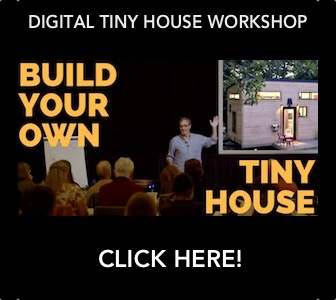 Bringing you 29 amazing tiny house plans, books, and courses from a diverse, talented group of experts from across the nation. The total value is $983, now available for only $49. Thatâ€™s 95% OFF! Learn the ins and outs of traveling with your tiny house on wheels, whether you planning a one-time move OR road trip. The best advice from the worldâ€™s most traveled THOW! We are sharing our extensive first-hand experience traveling with our tiny home. Our hope is to encourage and empower your own DIY travel experience. With the right preparation youâ€™ll be able to it the road, safely, and have the time of your life. Access the e-Course 24/7. Join the exclusive LIVE discussion and Q&A, 4/14 at 5 pm ESTâ€”replay available. Reach out to us if youâ€™re interested in collaborating on event or project. Inside the Florida Tiny House Festival, an epic gathering of tiny homes, inspiring speakers and community building. Featured over 110+ tiny structures-- tiny houses, skoolies, gypsy wagons, van conversions, Airstreams and vintage campers. Proceeds go to benefit local community, charities and good causes. Hosted by United Tiny House Association. The Ultimate Tiny House Festival: LIVE! Brought to you by the United Tiny House Association. The nationwide celebration of the Tiny Living Movement taking place across the USA: 3 TINY HOUSE FESTIVALS, 3 STATES, 1 WEEKEND. Tiny House Expedition on the Green, a tiny house community showcase, pop-up park & party, Approximately 3,000 folks came out to celebrate home, community, the completion of our tiny house on wheels & start of our expedition. Insights & inspiration from the tiny house community at the National Tiny House Jamboree 2015. Leaders in the tiny house movement share their tiny house & community building advice. Tiny House Expedition captures the essence of the Tiny House Jamboree 2015 experience. The tiny house tribe takes over Colorado Springs for an inspiring, epic weekend. Featuring highlights from this historic tiny house community gathering.